Chef Charles M. Carroll has answered our prayers and delivered a book, a bible, a life's journal shared by a real chef in today's modern kitchen. chef john false, cec, aac 'from time to time, I buy motivational books for my managing partners and chefs, and this book is my all-time favorite gift. Chef Charles M. Carroll has answered our prayers and delivered a book, a bible, a life's journal shared by a real chef in today's modern kitchen. 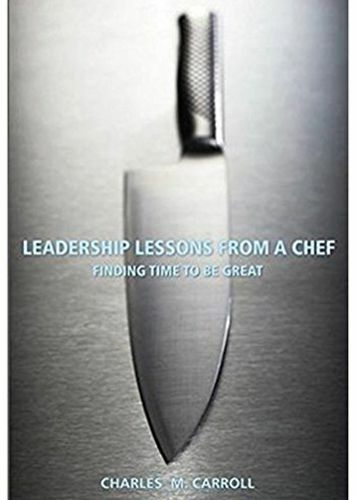 chef john false, cec, aac 'from time to time, I buy motivational books for my managing partners and chefs, and this book is my all-time favorite gift. What chef Carroll has to say is the real thing.' Johnny carrabba, founder, carrabba's restaurant a unique guide to leadership in the culinary arena, by a chef for chefs leadership lessons from a chef is about creating excellence in the professional kitchen. Here the difference between good and great comes down to the details, and attention to these details comes from the right attitude reaching across all staff. A good culinary manager, according to author and award-winning certified executive chef Charles M. Carroll, skillfully cultivates this attitude for success, and so leads the way toward kitchen excellence. Using stories and examples drawn from his many years' experience, chef Carroll gives you a leader's tour through the working kitchen. Offering proven wisdom in plainspoken terms instead of abstract management theories, the practical tools and ideas found in this groundbreaking book can be used immediately to motivate and develop an effective team environment among kitchen staffs. Leadership lessons from a chef features: chef Carroll's formula for managing kitchen staffs self: scheduling, empowering, and follow up and how the formula works in practice, take-away boxes that reinforce key points, chapters that progress logically, helping you evaluate and refine your goals, develop a mission and principles, and implement these in a motivational and positive way, helpful forms for both greater efficiency and esprit de corps, inspiring quotations, as well as life and work tips from chef Carroll whether you're a student just starting your culinary education, or an executive chef seeking to take your operation to a whole new level of excellence, leadership lessons from a chef is an indispensable resource for all stages of your culinary career.